Amid the waving palm trees of Southern Florida, there is a vibrant neighborhood located just west of downtown Miami that is teeming with Latin influences. Known as “Little Havana” or “Pequeña Habana” this area took on its identity in the 1960s as Cubans fled their native country in search of a better and arguably freer life. Little Havana became the home to counter-revolutionaries, a gathering point for ethnic Cubans who brought their rich traditions of food, music, and otherwise festive practices. Over the decades, Little Havana has burnished its strong cultural identity. As you travel through this neighborhood, you will notice the street names change into Spanish (Calle Ocho), residents assemble during the last-Friday-of-the month festival known as Viernes Culturales, and the monuments commemorate important historical figures (José Martí). And then there is the music that emanates from the bars, restaurants, and clubs: bright-edged percussion, sky-high horns, and ever-present clave. “As a twenty-year-old making my first adventure in Little Havana, I found myself fascinated by the sights, smells, and music. Fast forward forty years, and though Miami has evolved into a mega-city with skyscrapers, Little Havana is just as I remembered it, magical!” says Tim Smith, a maestro who has made this community the thematic centerpiece of his latest album. In 2014, Smith moved to Miami to pursue a master’s degree at the Frost School at the University of Miami. Upon graduation, he remained at the school as a fulltime bass instructor. After being a studio musician and producer for more than three decades, maestro Smith would become an educator. In a certain sense, Smith had “returned home.” He received his undergraduate degree from the University of Miami. During his time in Coral Gables, he played alongside venerable musicians like Jaco Pastorius and practiced in the same rooms that Pat Metheny and Bruce Hornsby once graced. Miami, the city and university, have been seminal parts of Tim’s geography and biography. Also integral to Tim’s life are his musical partners. He hails from a family of musicians. His brother, Roddy Smith, is a virtuoso guitarist based in Nashville. Growing up, Tim and Roddy listened to the music of Jimi Hendrix and The Allman Brothers, which set their hearts aflame in search of jazz melodies and rhythms. They began their lifelong careers as musicians, writing and performing without compunction. Tim and Roddy created the “Mr. Groove Band,” which began its successful relationship with the ZOHO label by being the producers and backing band for the 2006 ZOHO ROOTS release of iconic, soulful rock singer Bonnie Bramlett’s “Roots, Blues and Jazz” (ZOHO ZM 200604) which became one of the label’s biggest sellers. In 2007, Tim and Roddy’s second ZOHO production was a hard-swinging straightahead jazz album by Nashville saxophonist (and long-time sideman to this city’s rock’n’roll royalty Elvis Presley, Roy Orbison and others) Boots Randolph “A Whole New Ballgame” (ZOHO ZM 200705). These were followed by extremely well received tribute CD productions “Rocket 88  Tribute to Ike Turner (ZOHO ZM 200908) in 2009, and “Tribute to JJ Cale” (ZOHO ZM 201007 and 201008) in 2010. Later, in 2014, while serving as a professor at the University of Miami, Tim met Marcelo Perez, a remarkable percussionist from the San Francisco Bay Area. Almost immediately, Tim and Marcelo clicked, establishing a solid “pocket and groove” between bass and drums. Tim and Roddy put their band “back together again,” so to speak. But this incarnation was known as “Señor Groove” and would include all stars such as Marcelo Perez (drums), Martin Bejerano (piano), Murph Aucamp (percussion), Roddy Smith (guitar), and Tim Smith (bass). Indeed, Señor Groove has made this incredible album that is both a tribute and testimony of that western Miami neighborhood, where the coffee comes con leche. Little Havana is a reminder of the stay-up-all-night joys of listening to outstanding music that transports you into another community, one that is celebrated and cherished not just by Floridians but by Americans. What else could evoke the veritable melting pot of our country? An album by a band with members from different parts of the nation, coming together to capture the sounds of Pequeña Habana. “I hope this record gives you this sensation. Roll down your windows, go west on Calle Ocho. Put some jazz or rock on your radio, and let the worlds collide,” says Tim. 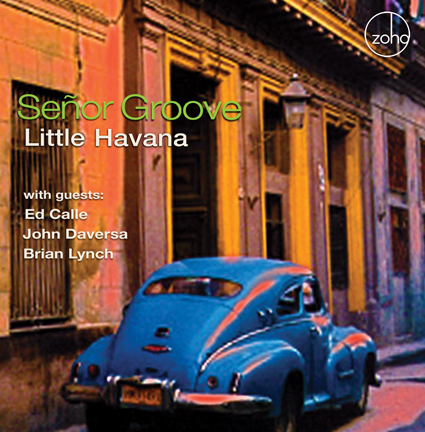 Little Havana features seven tunes, six of which written and arranged adroitly by Tim and Roddy Smith. It begins with 3.5X2 which is a reference to its 7/4-time signature. It’s a well-paced number with the melody played by Roddy Smith (guitar), Tim (bass), and Tom Kelley (saxophone). Over a tight groove, a space opens up for Roddy Smith to solo elegantly on the guitar, giving way to Kelley’s and Bejerano’s ascending improvisations. Drume Negrita is a traditional Cuban lullaby composed by Eliseo Grenet. It features the incandescent vocals of Argentinian singer Roxana Amed who inhabits the song fully, who phrases the Spanish lyrics with dynamics to match the band. Giving the song a plusher feel is a refined string arrangement by Gary Lindsay, and over which multi-instrumentalist Tim Gordon renders a thoughtful flute solo. Roddy Smith, Tim Smith, Marcelo Perez. The title track Little Havana is pure groove, with a soulful beginning with maestro Tim on the bass, who doubles the melody with Gordon on the flute. This bass-flute duet establishes an evocative contrast between low and high registers, an honorific to Little Havana itself: a community that took in those down-and-out as refugees but who, over time, were recast as leaders in their own right. This upward mobility is represented by David Sneider’s climbing trumpet solo. Indeed, this song is mellifluous, moving on a predictable path. Until  bam  the montuno begins! This musical wake-up is a reminder of the peppery flavors found in Little Havana. 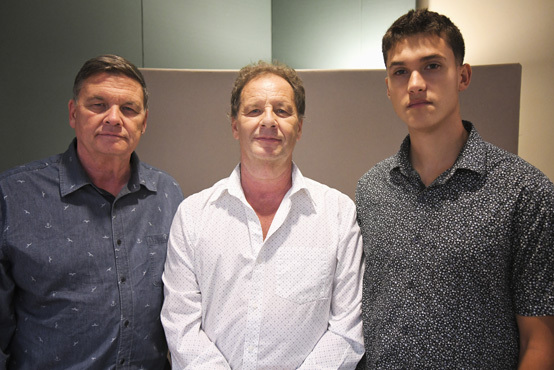 Lellarap is a composition that was inspired by Tim taking John Daversa’s composition course, in which the assignment was to incorporate parallel harmony. It includes a thoughtful and melodic solo by Tim (bass) that builds with verve and concludes with a fiery drum solo from Marcelo Perez. Originally composed as a Bluegrass instrumental, Linville Falls starts with brisk pace. Brian Lynch (trumpet) doubles the melody with Ed Calle (saxophone). Together they push the music into the next section, an evocative solo by Martin Bejerano. But this tune wouldn’t be true to form without Lynch, a heralded musician, singing through this trumpet into the higher registers. His expressive improvisation brings the tune home with aplomb. Second Time Around is other-worldly, incorporating synthesizers and spacey effects. This time it’s John Daversa on the Electronic Wind Instrument who takes the tune into a more contemporary era of Little Havana in which electronic music can be found in the clubs. This tune is also Tim’s take on his “second time” in Miami (separated by thirty-five years). The album concludes with C100 (in the Key of C and 100 beats per minute). Murphy Aucamp sets the pace with his conspicuously grooving percussion. The elevated playing of Gordon (saxophone) and well-contoured bass rhythms of Tim give this number a joyful, head-nodding vibe. This album has put to music the rich traditions of Little Havana  by big time musicians. It has indeed been a privilege for me to work with them on this important release. Señor Groove’s production presents not just a terrific Latin Jazz soundscape of this neighborhood but a soundtrack with an inviting and welcoming feel that will surely envelop you. Produced by Tim & Roddy Smith, Marcelo Perez, and Kabir Sehgal. Recorded August - September 2018. Chris Palowitch, tracking engineer, Weeks Studio Miami. Taylor Pollert string engineer (2) The Library Studio, Nashville. Phil Magnotti, mix and mastering engineer, Silvermine Studio, Norwalk, CT. Philip Avello photography. Al Gold, art direction and package design. Executive producer: Joachim “Jochen” Becker. Publishers: Sidesongs, BMI (1, 3  7); Ole Purple Cape Music (2).